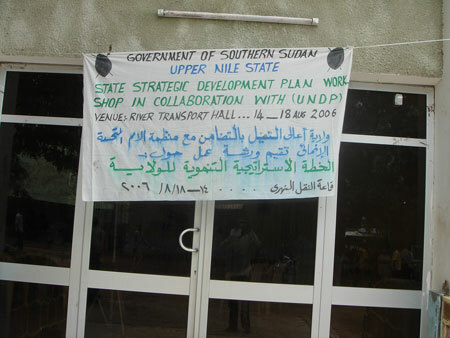 A banner displayed outside a planning meeting at a conference hall near the quayside in Malakal. Morton, Chris. "Planning meeting at Malakal" Southern Sudan Project (in development). 03 Jan. 2006. Pitt Rivers Museum. <http://southernsudan.prm.ox.ac.uk/details/2007.137.86/>.